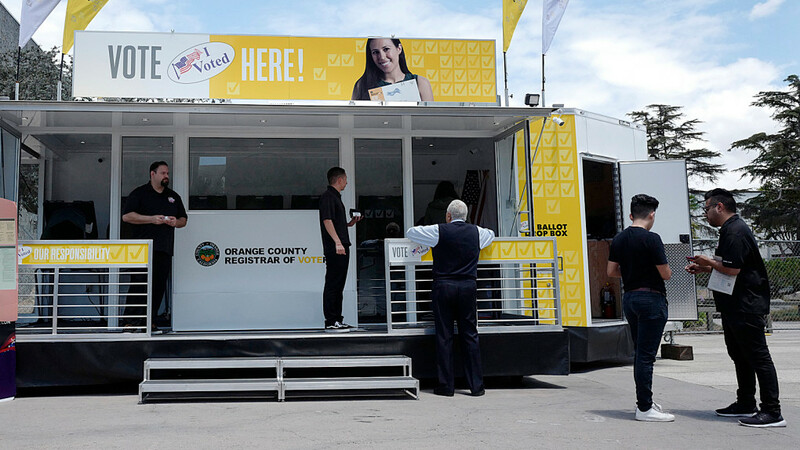 Voters who don’t want to wait until election day on June 5 can visit a voting booth early or drop off their mail-in ballot at six spots around Orange County over the next week, courtesy of the county’s new mobile voting service center. The voting center – essentially a pop-up trailer that holds a row of electronic voting booths and is staffed by poll workers – had a few visitors at its debut Friday, May 25, in the Santa Ana Civic Center, but upcoming venues may offer bigger crowds. Stops include Costa Mesa’s Segerstrom Center, where the hit musical “Hamilton” is running, and the Old Town Farmer’s Market in San Juan Capistrano. Besides being the state’s first such voting center, “The reason I think it’s super unique is we can put voting locations in places where you do not normally have voting opportunities or polling places,” Orange County Registrar of Voters Neal Kelley said. By noon Friday, the Civic Center was quiet heading into the holiday weekend, but poll worker Melissa Campbell said about 10 people had voted that morning, and numerous others dropped off mail-in ballots. To vote at the pop-up booth you just need to verify with the poll workers who you are, no identification is needed. Some people were surprised to see the voting center and had questions, while others wondered if the election was that day, poll workers said. Early voter Kim Sorgente, of Huntington Beach, said he’s not surprised at the lack of visitors, pointing to the chain-link fences lining much of the plaza. Kelley expects interest to grow as more people find out about the pop-up voting location, partly because he’s predicting healthy turnout for this election. About 20 percent more people have already voted than at the same time in 2016 – and that’s unusual for a midterm election, he said. And for those who like to wear their civic duty on their sleeve, not to worry: poll workers at the mobile voting station are stocked with “I voted” stickers. Be the first to comment on "“Pop-Up” Voting Comes to CA’s Orange County"